Professor Carl Artman recently served on a panel about efforts by the Santa Ynez Band of Chumash Indians to expand their reservation on Friday, Sept. 16. Artman’s presentation, “You Heard the Fiction, Now Hear the Facts: A Lesson in Tribal Governance,” was a response to the non-native locals protesting the efforts of the Chumash Indians. Artman, Director of Economic Development in Indian Country, was mentioned in the Santa Ynez Valley News and the Santa Maria Times as a panelist for the pro-tribe meeting. Professor Carl Artman defended the Santa Ynez Band of Chumash Indians’ right to expand their reservation, calling the protesting locals “a cannibalistic frenzy of myopic reactionism,” according to an article in The Los Angles Times on Sept. 25. Artman, Director of Economic Development in Indian Country, said during a Sept. 16 panel, titled “You Heard the Fiction, Now Hear the Facts,” the push from critics to deny the Chumash Indians’ more land was due to rumors and a hostile local press. Artman’s quote was also picked up by the Santa Maria Times and the Santa Barbara Independent. Have a Juris Doctorate degree from an ABA accredited law school. Be a member of good standing of the bar of any state or federal court. Be at least (25) years of age. Have experience as a tribal judge exercising both civil and criminal jurisdiction. Have considerable knowledge of Federal Indian law, of the Federal Rules of Civil Procedure and of Evidence, and of Arizona law. Have no felony convictions, no serious misdemeanor conviction. Demonstrate the ability to analyze difficult and complex facts and issues and to issue clear oral and written decisions based on application of the facts and issues to the applicable law. Be familiar with alternative sentencing and restorative justice. Demonstrate judicial knowledge and temperament. Demonstrate knowledge of basic principles of management/supervision/administration; personnel management, bookkeeping, record keeping, case management. Submit to and pass pre-employment background check and drug screen, including FBI criminal history background check. Candidates must not be a Tribal Council Member or the holder of any other elected office of the Havasupai Tribe. For persons who meet the above minimum qualifications preference will be given in the following order, to enrolled members of the Havasupai Tribe, enrolled members of a federally recognized Indian Tribe, and then others. Summary: To conduct the legal activities and services of the Public Defender’s Office; and to do related work as required. Responsibilities: The Tribal Public Defender represents in the Havasupai Tribal Court indigent persons accused of crimes. Representation includes all stages of the proceedings following the arrest of the defendant. This will include meeting with the client, obtaining police and other investigative reports, conducting an independent investigation of the crime, legal research and motion practice, referrals to outside agencies as warranted, negotiating plea agreements or preparing and presenting a defense at jury and bench trials, and other appearances in the Havasupai Tribal Courts as required. The incumbent shall discuss the public defense program with judges, prosecutors, law enforcement officials, and other persons to obtain information and possible action relative to defendants. Confers with office staff on clerical problems, record keeping, and reporting systems, and initiates changes as required. Dictates correspondence and prepares reports. Term of Office: The term of office shall be for two (2) years. Knowledge: Philosophy and practice of public defense in tribal courts; duties, powers, limitations, and responsibility of the Public Defender’s Officer; methods and problems of administering the work of a governmental law office; legal principles and their application with emphasis on criminal law; rules of evidence and the conduct of court proceedings; legal research methods. Ability to: Investigate and defend criminal complaints; analyze difficult and complex facts and legal problems and apply legal principles and their practices; present statements of fact, law, and argument clearly and logically in written and oral form; draft legal instruments and opinions; perform legal research; win the confidence and respect of members of the legal profession, public officials, and other persons contacted in the position. b. Equivalent combination of training, education, and experience that would provide the required knowledge, abilities, and license. 2. Be a member in good standing of the bar of any state or federal court. 3. Be at least (21) years of age. 4. Have criminal litigation experience and a demonstrated interest in Indian law. 5. Be of high moral character and integrity. 6. Have no felony convictions, no serious misdemeanor conviction, and, within the past twelve months, no misdemeanors in any court. 7. Be physically able to carry out the duties of the office. 9. For persons who meet the above minimum qualifications preference will be given, in the following order, to enrolled members of the Havasupai Tribe, enrolled members of a federally recognized Indian tribe. Interviews will be taking place on September 19, 2011, but the position will remain open until filled. NALSA will be hosting its 6th Annual Golf Tournament on October 22nd at the Whirlwind Golf Club. If you are interested in playing in the tournament, or becoming a tournament sponsor, we have provided links to forms below. Thank you for your continuing support and we hope to see you at the tournament! The EPA recently released its final policy on consultation and coordination with Indian tribes. The policy establishes a new, broader standard for the types of actions that may be appropriate for consultation — such as developing standards, guidance, policies, permitting decisions, and activities under international agreements — and makes clear the two-way nature of government-to-government consultation by inviting tribes to request issues for consultation. The policy also establishes a management, oversight and reporting structure that will help ensure accountability and transparency. In this one-hour TeleBriefing, our distinguished panel of legal and regulatory experts will address the practical implications of the new policy. Register now and call in from anywhere! 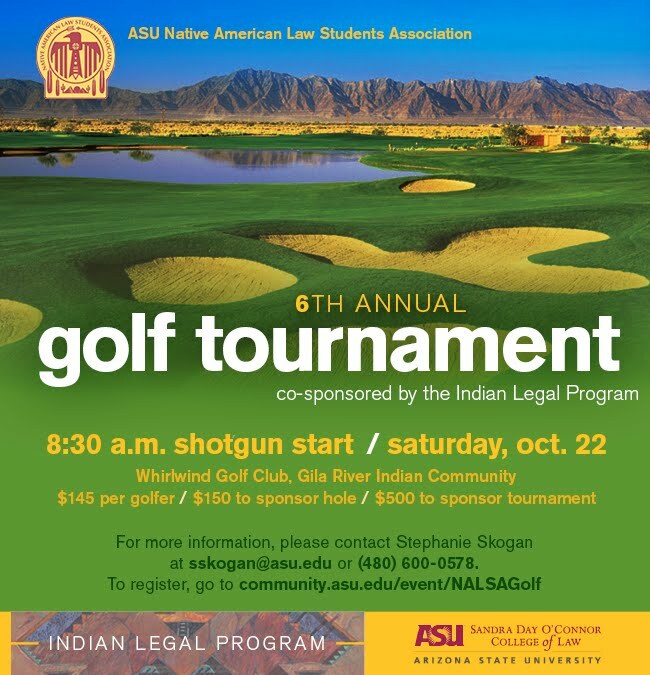 Attorneys, tribal representatives, business executives, and governmental officials.